After waiting for my PSU to arrive at Thermaltake, and for them to examine it; they have finally determined to send me a replacement unit. That replacement unit has now arrived! Everything is back up and running, with the addition of my new 512 GB SSD for more VMs. So, give me a little bit to get back in the swing of things, then I’ll post some new guides. Last Thursday I ordered a new SSD (the SAMSUNG 840 Pro Series MZ-7PD512BW 2.5″ 512GB SATA III MLC Internal Solid State Drive SSD) for my lab server, because I was running out of space. I received it yesterday, which is great, but also bitter-sweet since my Thermaltake PSU blew up on Sunday night! So, now I have to wait for my replacement PSU before I will be able to continue adding VMs to my lab. In the meantime, go and vote on what topic you would like me to cover next. Hello Everyone, I wanted to briefly share something that I recently discovered. If you read my last post about OS Installation and Using A Server OS With A Workstation Motherboard you may recall that a little .inf modification is required in order to detect/use the Intel 82579V Gigabit NIC in Windows Server 2012. 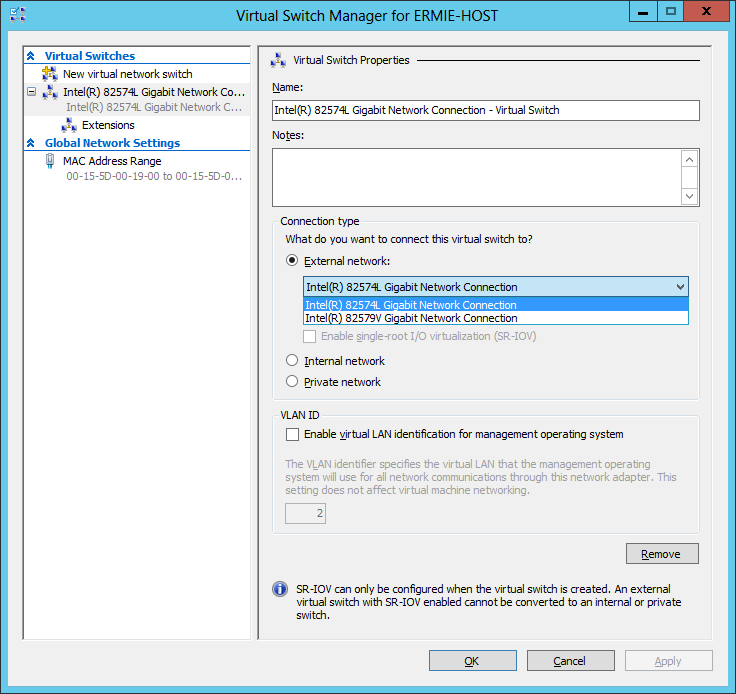 After getting this second NIC functional, I then proceeded to install Hyper-V. During the initial role installation, you are prompted to select a NIC as the Hyper-V virtual switch. However, at least in my case, although both NIC are now present to the OS, and functionality had been tested/confirmed, only the Intel 82574L appears in the list of NIC available. Therefore, it is because of this that I made my Intel 82579V NIC my external/Internet connection port, and the 82574L as my Hyper-V NIC. I emphasize during the “initial” role installation, because after Hyper-V is installed, when you access the Hyper-V Manager and open the Virtual Switch Manager, you can in fact change the external adapter from the Intel 82574L to the 82579V. Now, I haven’t tried this change yet, but I assume it would work on account of it being available in the list. Once I finish copying all 50 GB of lab software (i.e. OS’s, Middleware ISO’s, etc.) to my new host, I will then be in a position to start creating my lab environment (i.e. AD/Domain, SQL Server, System Center products, etc.). So stay tuned.